Often times in the NFL it can be difficult to win a game coming out of the bye week. That was the case yesterday for the Buffalo Bills, but they did enough to win 30 -27 over the Tampa Bay Buccaneers. As in most games, there are some positives and negatives for the winning team. Let’s take a look at both. With the win, the Bills record goes to 4-2 on the season and 3-0 at home. They stand ½ game out of first after New England’s win last night versus Atlanta. The Patriots have yet to have their bye. LeSean McCoy, after a longer than usual wait, had the type of big game that we expect, running for 91 yards and two touchdowns while also catching five passes for an additional 31 yards. Tyrod Taylor had some good and bad with his play. He threw for 268 yards and one touchdown while only being sacked once. He had to play from the pocket for a good part of the game and for the most part played well. His quarterback rating for the game was 96.5 showing how effective he was. Plus he didn’t turn the ball over. The offensive line played an effective game, only giving up the one sack and helping lead the ground game to 173 yards. Any time a team runs for that many yards in an NFL game, they should win! The defense continued to force turnovers. Yesterday they forced three, one interception and two fumbles. The final fumble led to the Bills winning field goal. Also the run defense was excellent, giving up only 69 yards and a 2.8 yards per carry average. Jameis Winston, playing with a sore shoulder, had a big day throwing for over 378 yards and three touchdowns but it could have been worse. The Bills only recorded one sack but they were able to put consistent pressure on Winston and forcing him to throw some off target throws. The Buffalo wide receivers are starting to get in the flow of the game. The wide outs as a group had 10 receptions. 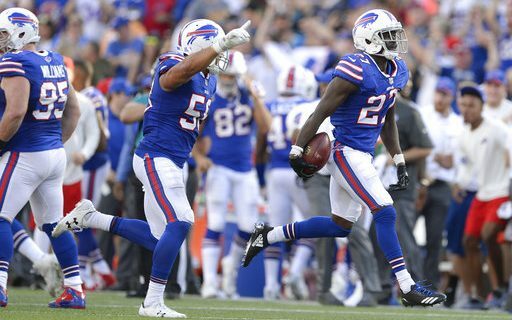 Newcomer Deonte Thompson, who was just signed Tuesday after being waived by the Chicago Bears, had four receptions for 107 yards in his Bills debut. Nick O’Leary will never be confused for Charles Clay, but Nick had two receptions for 58 yards. Both were at opportune times. The Bills defense, which had been leading the NFL in scoring defense, gave up 447 total yards and 27 points. There were some coverage breakdowns, most notably on the 33 yard TD throw to O.J. Howard. On that play, no Bills defender was within 20 yards of Howard. Howard was wide open on a few occasions and going forward this can’t happen. Tyrod Taylor had a strong overall game, but his clock management at the end of the first half was horrible. With 12 seconds left on the clock, Taylor threw a short out to the wide side of the field while the Bills were in chip shot field goal range. Jordan Matthews the receiver on the play did not have a chance to get out of bounds and the clock ran out without the bills attempting a field goal. Taylor is in his seventh season and knows he should never throw that type of pass. Likewise, Matthews knowing the time left on the clock should not have caught the ball. Two poor decisions on one play. If the Bills had not won, that play could have been looked at as the one that cost Buffalo the game. Buffalo only had four penalties for 35 yards but one was for a late hit that gave Tampa Bay some much needed yardage. Winning teams play smart football, that play wasn’t smart. Winning football teams consistently score points off of opponent’s turnovers. Yesterday the Bills got only three points off of three Tampa Bay turnovers. Granted, the three points were the game winning points, but the Bills have to do better in that category. Next week the Bills host the Oakland Raiders, another tough offensive team who are also getting 10 days rest after playing on Thursday night. The Bills D better be ready as Oakland has one of the better passing attacks in the NFL. Oakland quarterback Derek Carr is one of the bright young quarterbacks in the league and soon figures into being one of the top quarterbacks in all of football. The Raiders star on defense is former UB great Khalil Mack, a pass rushing terror coming off the edge.